The inspiration for this project were various youtube videos where there is a hose taped to a speaker vibrating at the same frequency as camera's frame rate. Due to the sampling frequency, water coming out of the hose seems to be frozen in space and time or going slowly up or down, seemingly defying the gravity. I wanted to improve this concept by making it interactive and visible to the naked eye. This way, people could play with the installation and explore physical laws used to make it happen. To create the desired effect without a camera, we used a LED strip controlled by Arduino flashing 1 ms pulses at constant frequency. The speaker was controlled by a Pure Data patch and the frequency could be smoothly varied by interacting with a Leap Motion controller. 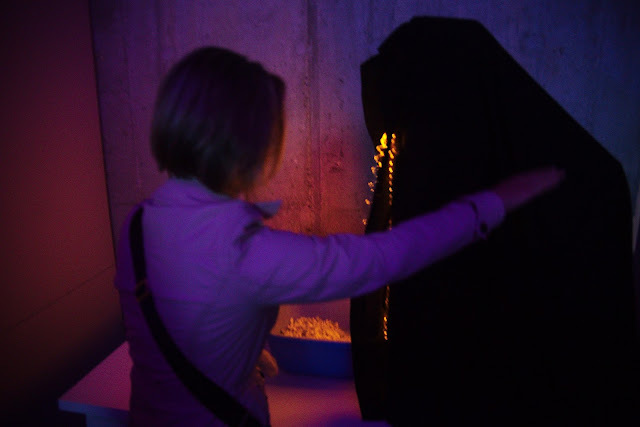 Visitors could make the water drops move up or down just by raising and lowering their hand above the contorller. 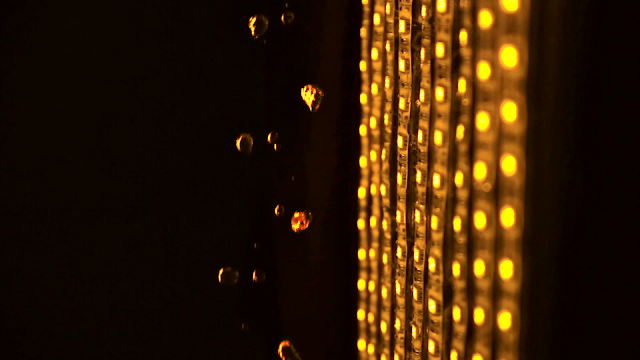 When there were no hands over the controller, the frequency smoothly changed to the frequency of the LED strip, thus freezing the drops in the air again for the next visitor. The interaction can be seen on the video above. I was standing at the installation, providing assistance and observing the visitors. Majority of people tried to move their hand down first to unfreze the water and make it move naturally down. Then they raised their hand to the point where the water froze again. After that, they started to move their hand higher, to make the water go up. This was a rare learning moment. When they moved their hand down, a model of interaction started to form in their mind. According to this model, altitude of their hand mapped to the speed of falling of the water drops. A contradiction appeared in the mind of the visitor: when the hand is high enough, does the water start to move up, or does the law of gravity prevail? It should be impossible for water to go up, right? So they just try, move their hand up and learn. Not putting artificial limits to what the visitors can do and providing continuous, consistent interaction is very important in order to create the learning moments and make the installation truly engaging and memorable. We could just put buttons there, "down" "freeze" and "up". Visitors would still see the water go down, freeze and go up. However, this would be a complete waste of potential of the installation and the interaction would be killed. Instead, we created a space which the visitors could explore and learn from. Huge thank you goes to Rastislav Somora, who built a custom Arduino shield for powering the LED strips and helped with the construction and electronics.